Apple’s launch of Siri certainly made people sit up and take notice. There had been voice recognition and dictation apps before, even Siri in its earliest incarnation was a standalone app that offered some of the features we all now take for granted from our iPhone 4S devices. Even with apps and services already out there, nothing came close to competing with the polish and experience that Apple had managed to put together with Siri, but that hasn’t stopped developers from trying to catch up. Android, especially, has seen plenty of apps released which claim to offer Siri-like functionality for Google’s mobile OS. Some are not too bad, while most are woeful. Now there is a new one on the block, or is there? Going by the name of Siri for Android, and made available by a developer calling themselves "Official App," things start to get a little worrying right off the bat, and after looking a little closer they get downright dirty. Using a name like "Official App," the developer is clearly hoping that people will believe that this is an official port of Apple’s Siri – something that just isn’t going to happen. What the app actually does is to create a new icon that mimics the Siri on. Once tapped, Google’s own Voice Actions app is loaded. At least the developer isn’t trying to hide the fact. 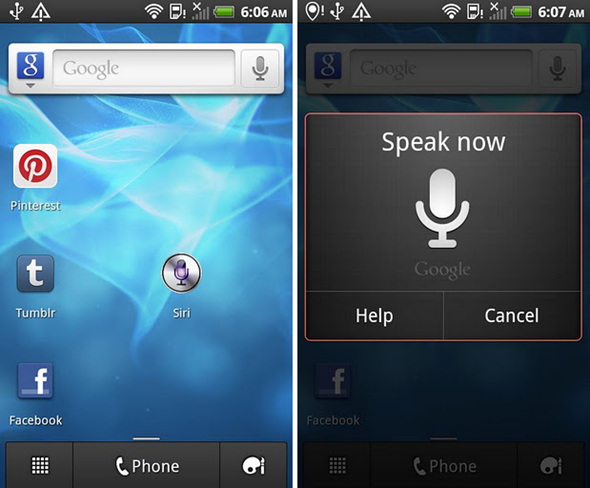 Siri, now for your Android device! This application is a Siri icon that opens “Google’s Voice Actions” app. The problem is, this app has already been downloaded by over a thousand people, and that number will only continue to grow. While we have no proof either way, it is entirely possible that this app could be doing all kinds of nefarious things in the background, but we just don’t know. Google’s own Market rules mean that the search giant has little, or no input in what goes on in its own app store, and that is the way many like it. When situations like this arise though, we do have to wonder whether there may be a middle ground that needs finding – perhaps between Google’s "anyone can do what they want" and Apple’s "we’ll tell you what you can do" approaches.